Aakhi helps us very diligently with our domestic chores and was in a lot of distress. 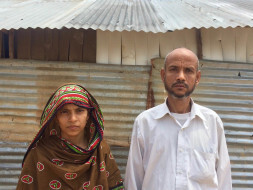 Soon enough, she shared her story, which is of her husband Kabir Hossain's illness - that he's been diagnosed with Hepatitis C about 2 years ago. The family had spent almost all of their money on surgeries, doctor visits, etc. but the condition was constantly deteriorating. Aakhi was not only troubled by his illness but also due to the fact that she and her only son (who works as a canteen service staff in an MNC) are the only bread-winners for a family of 7, making ends barely meet since Kabir has been bed-ridden for the last 2 years. Being an outsider to the city of Bangalore makes the situation worse for the family. 1. Endoscopy to understand the current situation. We visited Fortis, Whitefield and consulted Dr. Raju (Consultant GI Surgeon) for this. He showed us the situation of the liver and the digestive tract, which was infected by the Hep-C virus. Further, he guided us to meeting Dr. Veerender at Fortis, Bannerghatta Road for further steps. 2.1. A set of medicines (tablets, syrup) to facilitate improvement of the liver function so that food consumption may improve. 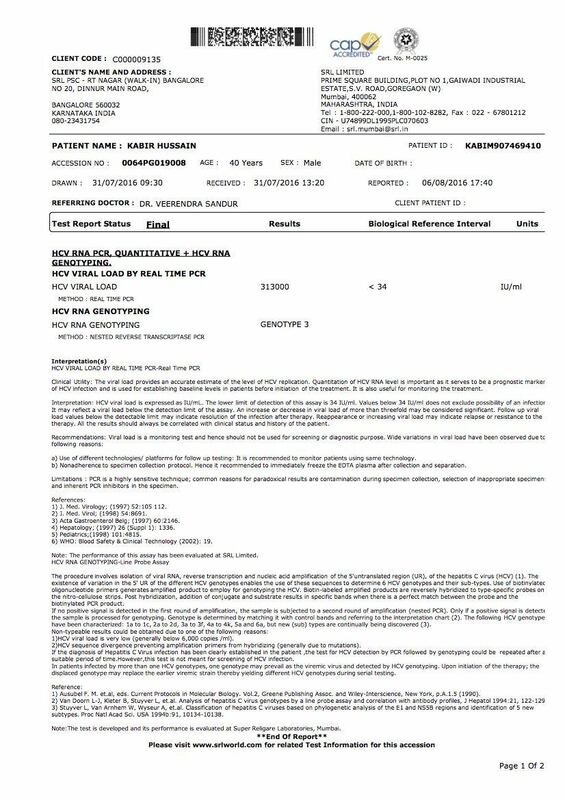 2.2 We get a blood sample test done for both Kabir Hossain and his wife Aakhi, since the Hep-C virus could have been transmitted to her as well. 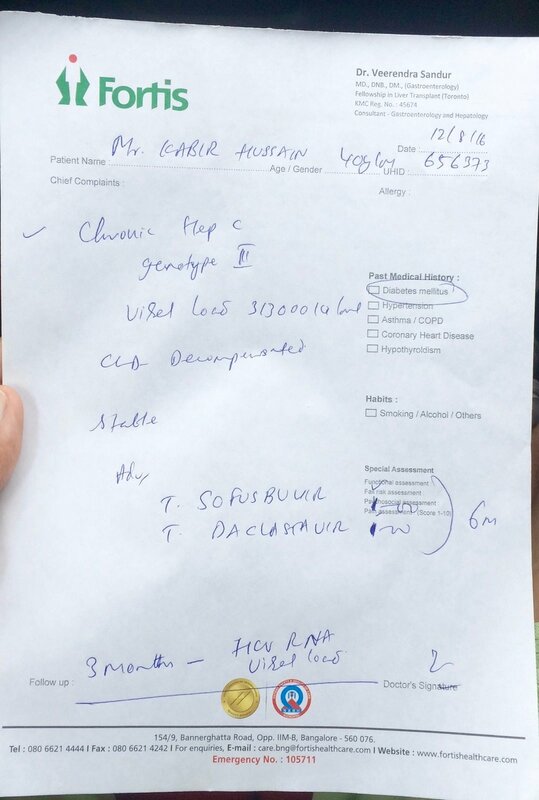 3.1 Aakhi luckily was not infected - that is good news. 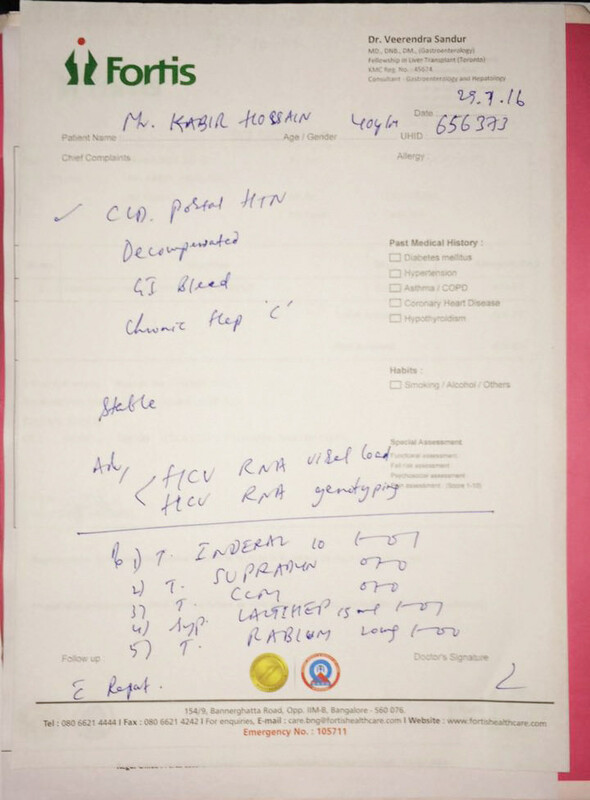 3.2 Kabir Hossain had a Viral Load count of 3,13,000 - that is classified as Genotype 3 (more). 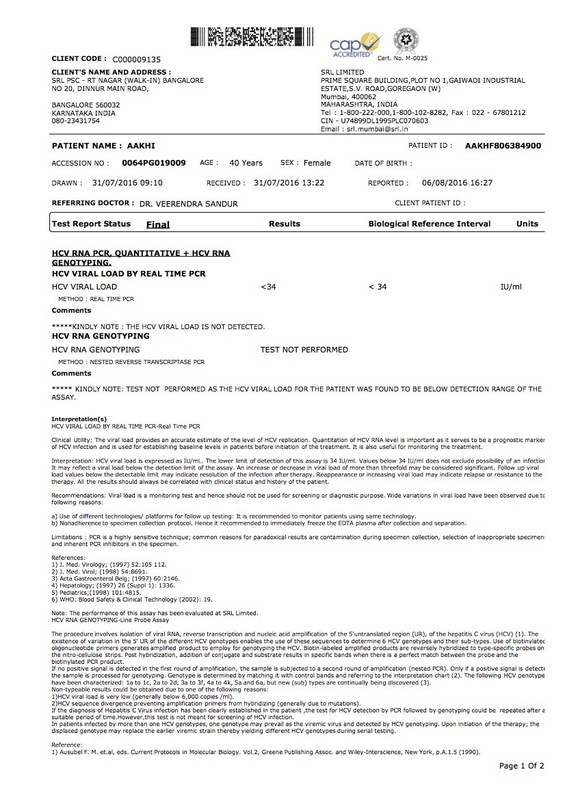 This meeting with the doctor was with the blood sample test reports. Dr. Veerender showed us the way further with another good news that the Hepatitis C virus can today be almost 100% eradicated from the body by medication alone - a course lasting 6 months, without the need of a surgery of any kind. Even better news is that it is not very expensive either. To quote exact figures, a patient can be cured of the C virus by a medication-treatment that will cost about 80,000 rupees. 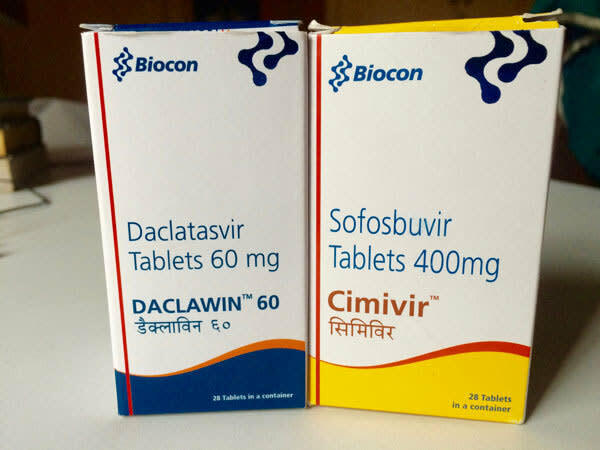 The drug Cimivir (one of the drugs which the doctor has prescribed) has been made available by Biocon in India recently, and this is going to benefit millions of patients ailing due to this deadly "slow poison". The other drug that the doctor has prescribed is Daclawin. Look forward to your valuable contributions. The first batch of medicine has been procured. 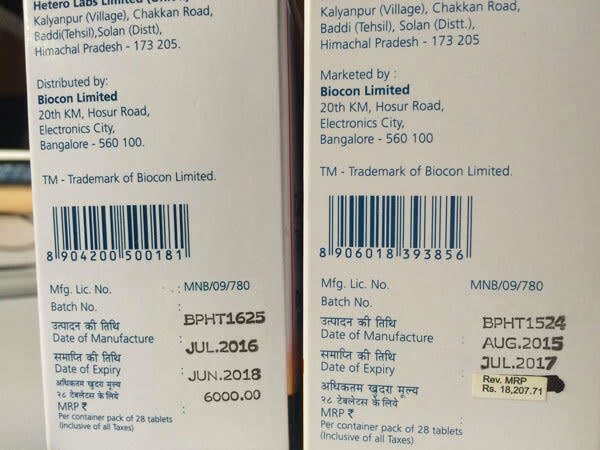 Although the medicine is available in the market off-the-counter at a higher price, we approached the dealers who were recommended by the doctors and procured these boxes at a total cost of 12,026/- (Aakhi forgot to get the bill with her, so will attach that in the next update). The tablets are to be had 1 each after the morning meal. Additionally, the goal is now 10k lesser and down to 70,000. This also means that we need only a little more than 25k to complete the funding for the treatment. In the meanwhile, a BIG "thank you" and a warm hug to all the people who've come forward to donate for this cause. Some of you, dear old friends and some of you new ones and well, some of you even anonymous. I can already see Aakhi a happier person as hope is back in her life. Thank you to everyone for contributing in changing her life.